Some travelers seek plush, queen-size beds and waterfront views. Others yearn for a changing horizon and the open road. 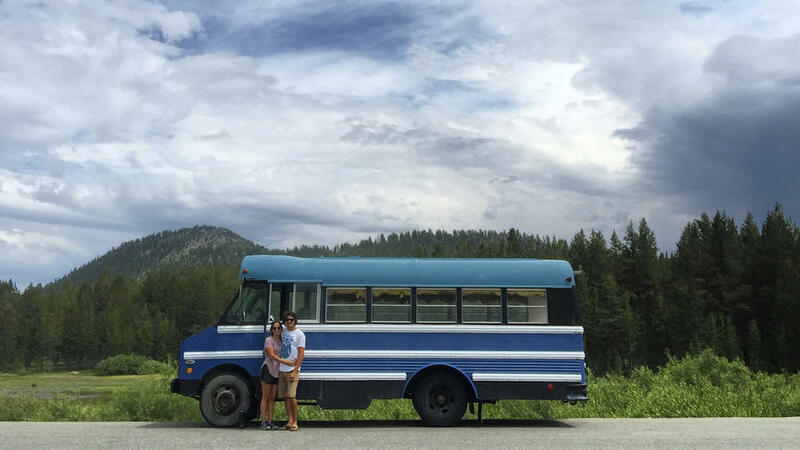 Lake Tahoe residents, Nick Cahill and Jessica Perez, soak up the best of both worlds with their Blue Bus Adventure, a vehicle that’s part vacation vessel, part tiny home. What began as a hunt for a towable camper resulted in the spontaneous purchase of a 1988 vibrantly, blue school bus. Equipped with its own character, the original 33-passenger Thomas Built ‘Mighty Mite’ came with stain-glass entry windows and a boisterous paint job. Six months later, the couple has revamped the interior with bamboo hardwood floors, four pullout drawers under the bed, a wood burning stove with plenty more to come. Mid-way through the epic tiny home renovation, Cahill and Perez will soon have a complete kitchenette, a queen-size bed that converts into two 4-person love seats, a reclaimed granite rock fireplace; solar power, a reclaimed wood dashboard, plus a rooftop platform that fits anywhere from 8 to 10 people. Avid outdoor and music lovers, the owners have routed the bus through multiple mountainous views, stretching from Mount Shasta to Oregon with Burning Man chalked as August’s main stop. As the media director of Force 12 Media, Inc. and a photographer who recently claimed the cover of a National Geographic issue set to publish this fall, Cahill’s account comes with enough shots of handiwork and nature to please DIYers and travel fiends alike. Garnering over 2,400 Instagram followers, Cahill and Perez’s ambitious venture has already attracted a range of sponsors including: Home Reserve, Proper Grounds Coffee, Diff Eyewear, Nemo Equipment, and Sip Caddy. What’s next? Looks like we’ll have to wait and see. Explore Cahill and Perez’s road less traveled via @BlueBusAdventure.